It is in the nature of pyramid style table displays that something has to be on top. This is a dark irony when it comes to books about a child’s first day of school, since elementary schools are not meritocracies and stark Darwinian undertones are not quite the thing in kindergarten anymore. Ah well, there it is. 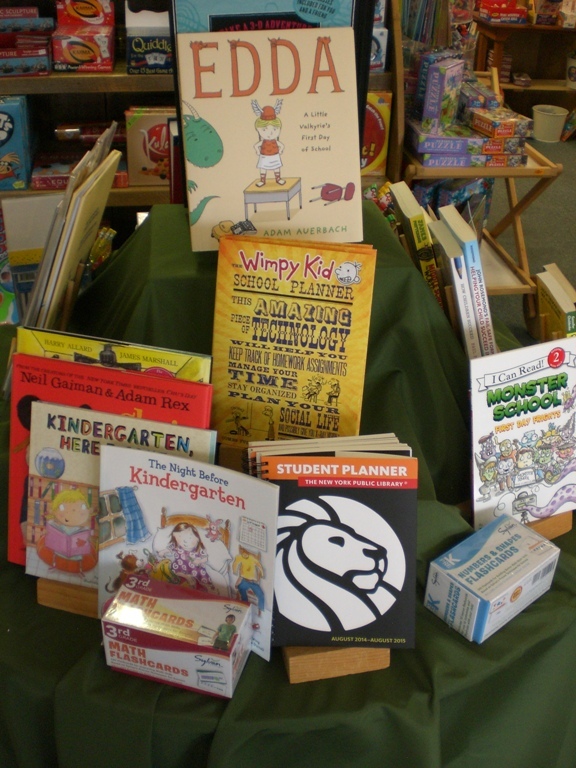 Now if you look at the top of the display you’ll see my new go-to book for the first day of school, Edda: A Little Valkyrie’s First Day of School. 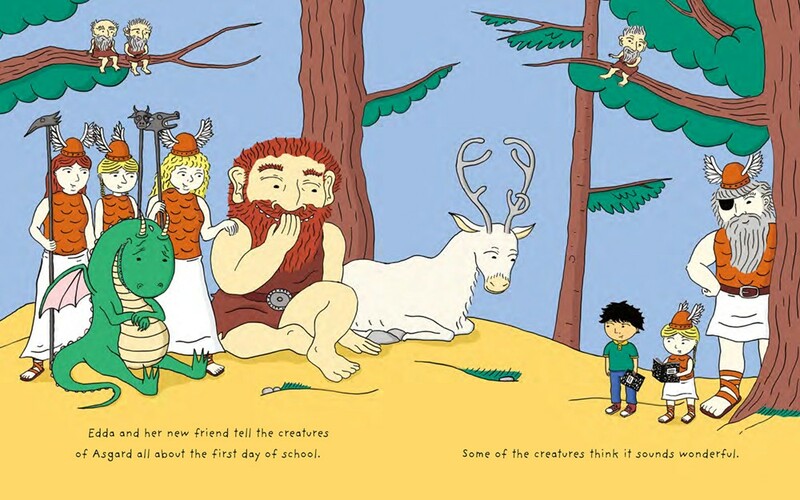 When you read the pages of Edda you will encounter all the qualities that constitute a perfect first day of school book. It’s reassuring, funny, and full of both challenge and adventure. Edda is the youngest Valkyrie in Asgard. As much fun as she has helping seek out unruly monsters, feasting, and riding magical animals, Edda yearns for some companionship with children her own age. Her father, Odin, has the answer. Edda can attend school down on earth. This peaceful relationship with adventure and wonder is the sort of parenting you’ll find in Edda too. 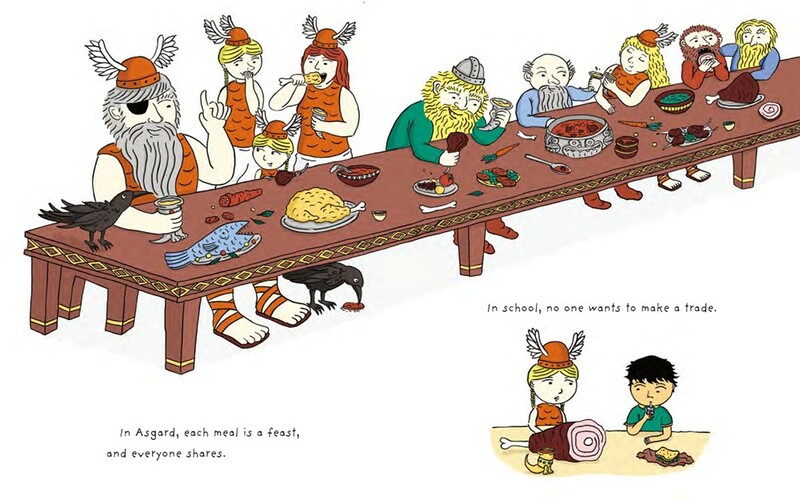 When Edda makes friends with a boy in her class, Odin takes the two of them off to Asgard on his flying horse for a play date, and the Mom of Edda’s friend waves them off with the same cheerful grace one might have expected were her son being driven to a friend’s house in a minivan. This entry was posted in Uncategorized on September 4, 2014 by Kenny Brechner.